Porsche has revealed what will be the last incarnation of the ’Porsche 997′ Porsche 911 GT3 Cup car before it makes way for the new Porsche 911 ’Porsche 991′ which will hit our showrooms next year. However, this Cup car will get a stay of execution, with Porsche offering it for competition use in the 2012 and 2013 race seasons. Endurance racers will benefit from the addition of the car’s new 100-litre FT3 safety fuel tank, which feeds an engine with a near-identical specification to the unit found in Porsche’s GT3 RS road car, namely a 3.8L naturally-aspirated six cylinder – good for 450 hp. Drivers taking part in the Porsche Mobil 1 Supercup, which supports the Formula 1 circus, will be offered the luxury of Porsche Ceramic Composite Brakes (PCCB). This lightweight option is also available on the RS road cars (for around €6,000), and helps to shed 20 kilograms from the car’s weight when substituted for the composite cast brakes found on Carrera Cup and GT3 Cup Challenge cars. The price is € 161,750 – before taxes. 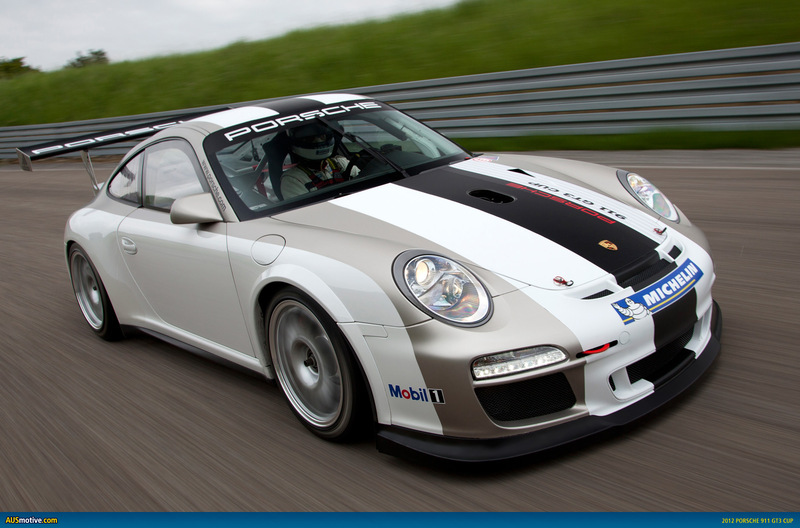 It is the most successful race car on earth: The Porsche 911 GT3 Cup. With over 2,200 units sold, it is the undisputed number one amongst customer racing teams all over the world. Now, the new Porsche 911 GT3 Cupfeatures a 100-litre FT3 safety fuel tank, which is filled via an opening in the front bonnet. Compared to its predecessor, the vehicle is now suitable for an even wider range of endurance racing. 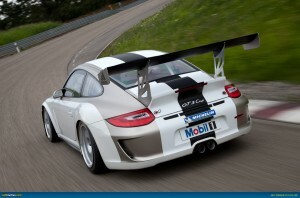 Moreover, the new fuel tank contributes to a further improvement of the high safety standards.The 2012-spec Porsche 911 GT3 Cup is based on the lightweight Porsche 911 GT3 RS (Porsche 997) street sports car. 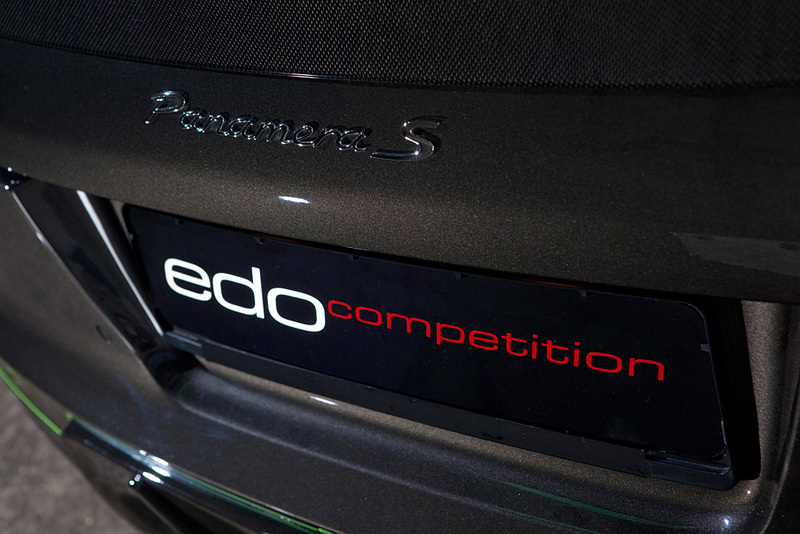 The power unit is largely identical to the production engine of the Porsche 911 GT3 RS with the same output of 450 bhp and the same maximum engine speed of 8,500 rpm. A race exhaust system with a controlled catalytic converter keeps emissions to a minimum.The flared wheel arches at the front axle accommodate light alloy rims measuring 9.5Jx18 with 25/64-18 Michelin race tyres. The light alloy rims at the rear measure 12Jx18 with 30/68-18 tyres. Depending on the type of racing, the new Porsche 911 GT3 Cup features different rim specifications. The blade-type anti-roll bars at the front and rear are adjustable in seven positions allowing an extremely precise set-up for each race track. Exclusive to the Porsche Mobil 1 Supercup which runs as support to Formula 1 is the PCCB Porsche Ceramic Composite Brake. This is also available for Porsche’s road models. Compared to the composite cast brakes in the Carrera Cups and the GT3 Cup Challenges, PCCB reduces the weight of the car by around 20 kilograms. The cockpit of the new Porsche 911 GT3 Cupcaters for the needs of the driver. The controls for the info display are positioned on the steering wheel which houses six switches. As in the production car, the reach and height of the steering wheel can be adjusted. 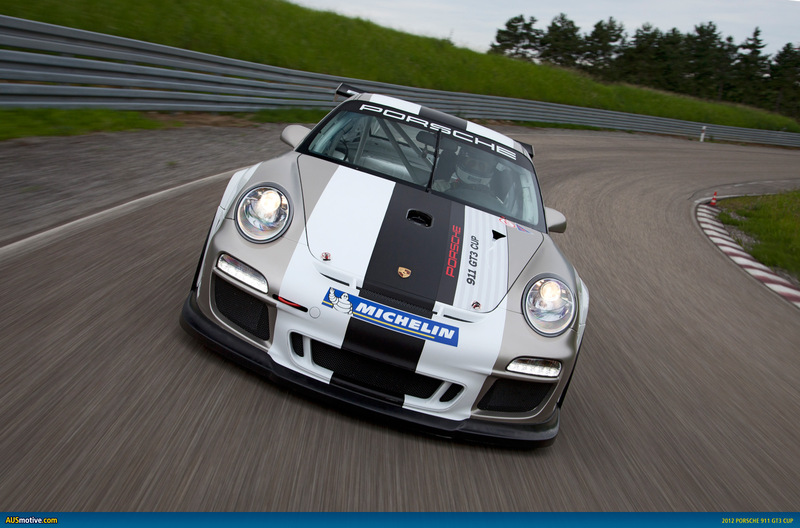 Currently, the Porsche 911 GT3 Cup competes in 19 Porsche brand trophy series worldwide. Moreover, it is run in various GT race series and at long distance events. The Porsche 911 GT3 Cup is the basis model of Porsche’s racing vehicle range. Additionally, Porsche Motorsport offers the 911 GT3 R for championships complying with GT3 regulations and the 911 GT3 RSR built according to GT2 rules.